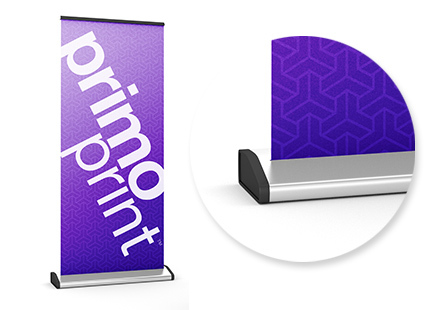 Our deluxe banners stands are a more stylish alternative to our roll-up stand banner. They provide an effective and convenient way to highlight a business, product, service at any trade show, event or exhibit. This roll-up banner stand is printed on durable, high-quality 10mil vinyl. Deluxe retractable banner stand offers a heavier, bigger base with chrome allowing them to stand out and get noticed. The banner comes with a convenient carry case making them portable and easy to collapse in minutes. Choose from a large selection of sizes to meet your promotional needs. This sturdy banner is easy to use and quick to assemble.